Home / Eczema / October is Eczema Awareness Month- what is eczema? October is Eczema Awareness Month! This month, Baby Pibu will feature topics and discussions centered around eczema and its common associations. Check out the National Eczema Association as well this month to become more aware about eczema. Now, most of you have heard of eczema, but you may wonder, “What is eczema?” and “What does it look like?” We want to keep it simple for you- we want to help you understand what eczema means, how you can spot it, and how you can soothe it. Eczema is aka Atopic Dermatitis, and it affects about 20% of us. Eczema is part of the Atopic Triad, which consists of eczema, asthma and hayfever. If a parent has any one of the atopic triad conditions, then his or her child is at an increased risk of developing eczema. Eczema can range from mild to severe cases, with most eczema cases being mild. Think of eczema as a skin condition that occurs when sensitive skin becomes “rashy” when it gets too dry or irritated. Here is how you spot eczema. Eczema appears as an ill-defined red or erythematous scaly rash that typically affects different body areas based on age. From 1 month old to 2 years old, eczema most commonly afflicts baby’s cheeks and the extensor (outer) sides of the arms and legs. From 2 years old to 10-12 years old, the flexural areas like the antecubetals and popliteals are affected. From youth to adulthood, eczema can appear as small round spots randomly on the body called nummular eczema to focal eyelid or hand eczema. Here are a few simple tips to prevent and soothe eczema. 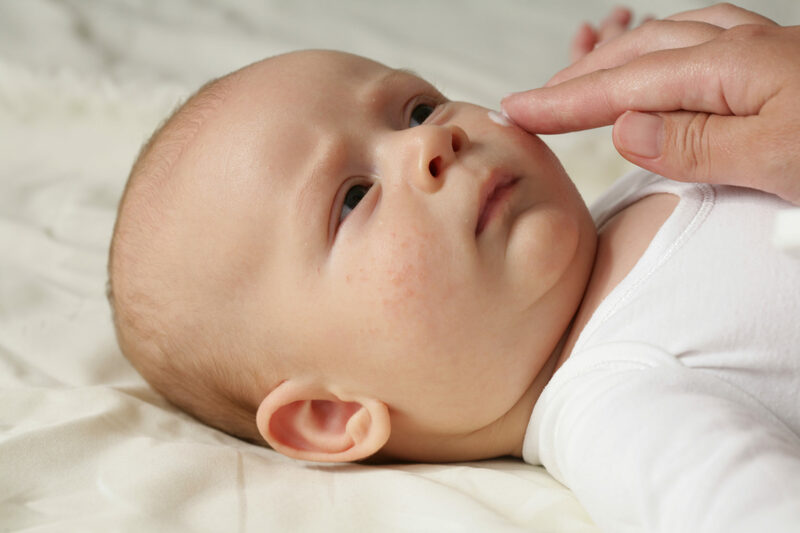 To prevent eczema, simply keep your baby’s skin moisturized and hydrated regularly. This simple tip can make all of the difference. The type of moisturizer you use matters. Ointments are the best moisturizers followed by creams and then lotions. The reason why ointments are better is that ointments are emulsions with more oil than water. Water actually dries out the skin so that is why lotions, which have more water, are not as moisturizing. If eczema is spotted, then switch over to an ointment-based moisturizer immediately and use it several times in a day. Routine baths are fine to keep doing to prevent a secondary infection. Secondary infections worsen eczema so bathing with a mild soap and water can help prevent that. On those hot spots of eczema, you can try using an OTC 1% hydrocortisone cream two to three times a day for three days. If those eczema flares do not improve, do not waste time- see your dermatologist or pediatrician for further recommendations. ← How Much Sleep Does My Baby Need?